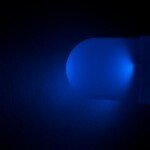 LEDS: Why Do Different LEDS Require Different Voltages? If you are like me, you probably have a bag of assorted LEDS in a dark corner of your toolbox or in your Discover Electronics kit. You want to use one of those LEDs for your next big electronics project but you’re not sure what voltage is required. Why can’t all LEDS require the same voltage? A light emitting diode (LED) functions in the same way as a normal diode. There are two nodes within an LED. One node is made of a processed material called P-type semiconductor. The other node is made of a N-type semiconductor. When electrons flow from the P-type semiconductor to the N-type semiconductor they fall to a lower energy level and release electrons in the form of light. The amount of energy required to release an electron in this way is called the band gap. 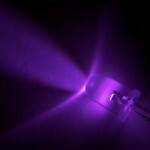 Different color LEDs are created by using semiconductors with lower and higher band gaps. A red LED is made from a low band gap material called Aluminum gallium arsenide and therefore requires a lower amount of voltage to produce light. This entry was posted in News on September 30, 2009 by Luke BrownGold.